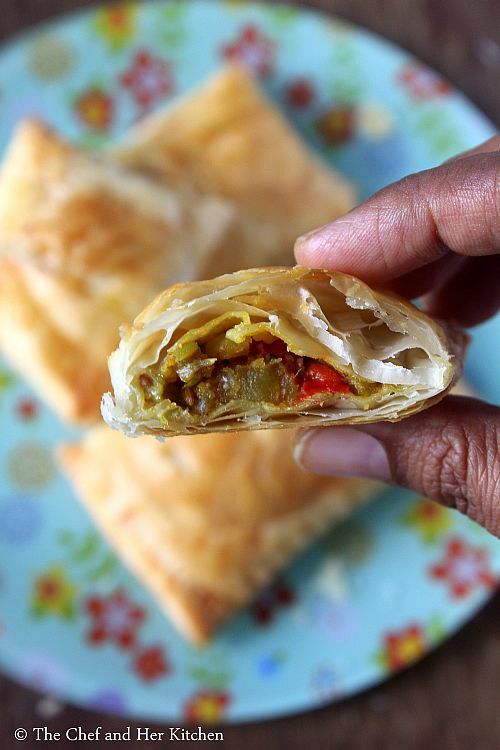 Veg puffs recipe using ready puff pastry sheets at home with step by step photos.Vegetable puffs or Veg puffs is one of the popular snacks in most of the bakeries across the country. 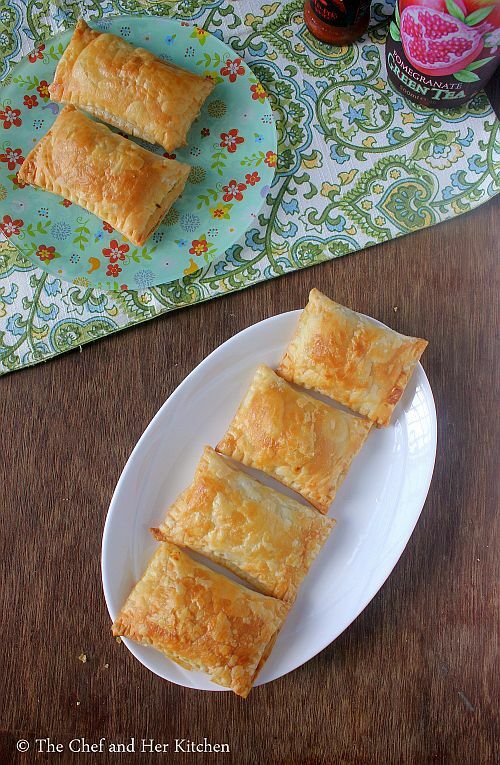 A spicy vegetable filling is filled in a puff pastry and baked to golden brown which gives a crisp yet a soft bite to the puffs and the butter loaded puff pastry lends a slight sweet and very buttery texture to the final baked puffs. 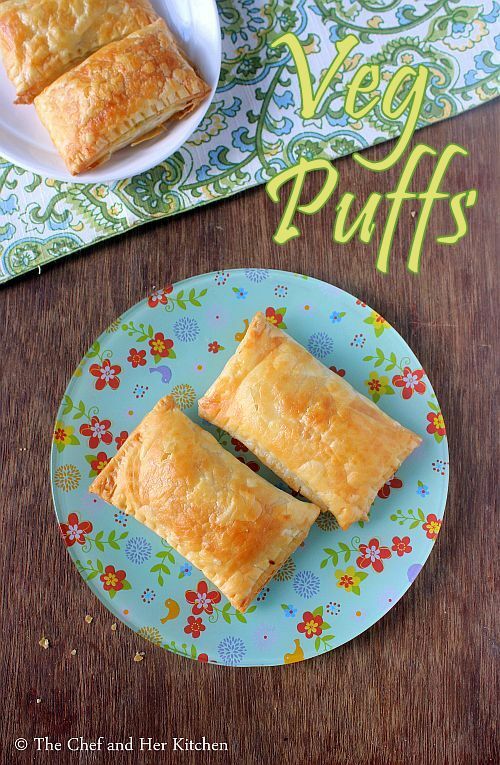 Veg puffs and Egg puffs were one of those most common snacks which we used to get home when we were kids.Though I do not prefer to eat eggs in the omlette form or any other forms I do not mind to eat it in a boiled form or use it in bakes. Veg puffs taste best when they are served hot/warm with tomato sauce along with a cup of tea/coffee and also you can carry them for a picnic too and they taste good even at room temperature. I usually use ready puff pastry sheets which are pre rolled and all you need to thaw a couple of sheets and prepare the filling and bake them as mentioned below, it is a very good and filling snack and is definitely a crowd pleaser.But you also get puff pastry dough where one can roll the dough and follow the same process to bake them or one can prepare their own puff pastry dough and follow the recipe. 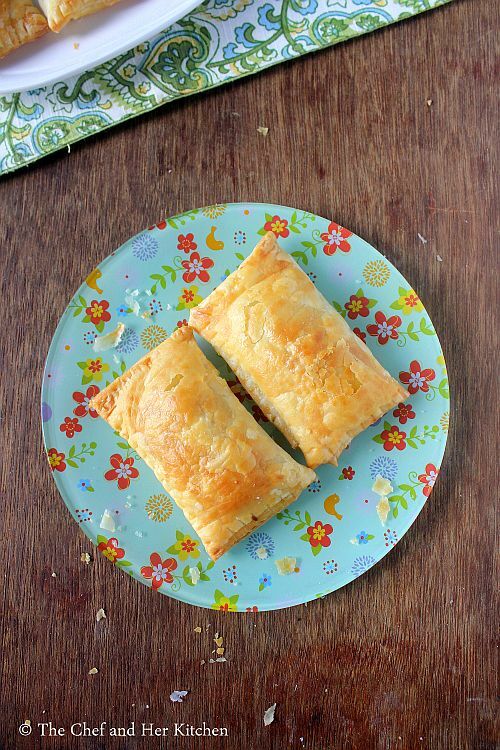 I personally have never attempted to make my own puff pastry dough just because I need small quantities at a time and also the rolled sheets are available easily and I would love to attempt to make my own puff pastry dough one day. Check out other snack recipes in my blog - Vegetable Chops, Vegetable Sandwich, Vegetable Idli, Onion Samosa, Veg Uthappam. Heat oil in a kadai and crackle cumin seeds and then add finely chopped onions, ginger-garlic paste and green chili paste and fry them until the onions turns slight pink in color. Add the chopped vegetables and fry well for 2-3 mins and then add salt and turmeric powder annd add 1/2 cup of water and cover it and cook until the vegetables are done.Add more water of required in between but make sure you use less water as we want our mixture to be dry at the end not soft and mushy. Once the vegetables are cooked add red chili powder, garam masala, amchur powder and mix nicely and cook for another 2-3 mins. Add coriander leaves and mix well and let it cool a bit. Thaw the puff pastry sheets as per the instructions mentioned on the pack. Mine were already rolled so I did not need to roll them.But if you need to roll the pastry follow the instructions mentioned on the pack, roll the puff pastry by sprinkling some flour on the puff pastry and roll it into a large square preferably of 1/2 cm thickness and cut into long rectangles or squares and keep them ready.Check the pictures for a rough idea to get the size of the squares/rectangles in which the puff pastry is to be cut. Place 2 tbsp of filling on one side of the puff pastry and brush some water at the edges and fold from the other side and close it gently,you can use a fork and press it to create some patterns at the corners. Arrange them on a baking tray lined with a parchment paper and brush with milk on top of the puffs. Bake the puffs in a preheated oven for 30-35 mins until the puffs are golden brown in color.Keep an eye after 25 mins and check whether they are done or not. Remove them and let them sit in the tray for a while and put it in the wirerack to cool if not serving immediately. Serve them hot/warm with tomato sauce. You can even steam or pressure cook the cut vegetables and then add to the fried onion mixture and follow the same process. You can add small cubes of paneer to the vegetable mixture to make paneer puffs. If you like to prepare Egg puffs, you can boil a couple of eggs and peel them and cut into halves and add the cut eggs to the vegetable mixture and mix nicely until it coats the eggs nicely.Place some vegetable mixture and one halved egg(flat surface down) at the center of the puff pastry square and join the edges on top of the egg to give a shape like danish pastry. 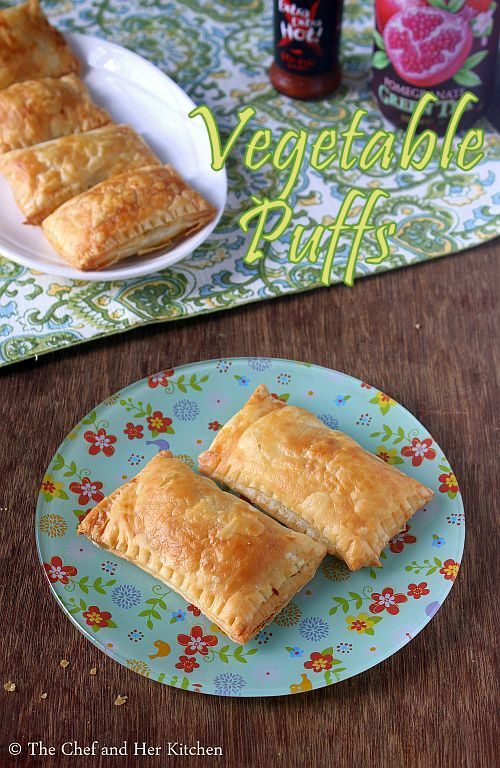 Very nice recipe of veg puffs to prepare easily. Are the puff pastry sheets available in market easily? Whaf should be the oven temp please?